Visit ECO Jackets Page on our Main Site! 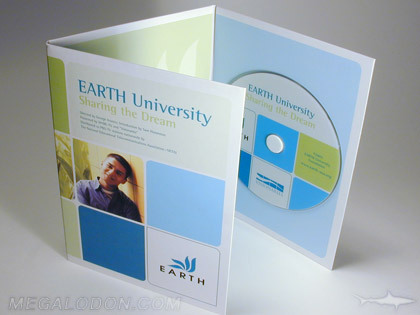 DVD Replication Packages with 4C Printed Tall Recycled Jackets. Look below for popular options for printed 4 panel and 6 panel CD jackets sleeves. Printing is full color on cardboard stock with your artwork. Truly Eco is our special eco-friendly stock and is a softer paper stock with a very high post consumer waste percentage (70-80%). We also have a less-soft paper stock with 20-30% recycled content. Both are available coated or uncoated. Fiberboard stock is another option, uses unbleached, end of chain pulp material, is brownish in color and has a nubby texture. See our special page on spot white ink on fiberboard packaging, setup and examples. We love custom dvd packaging! We have a large variety of die cuts we have made for clients, or we can create a new one for you. Fun options include foam hubs, pinch pockets, slot pockets, extra pockets or hubs to hold more discs or literature, diagonal literature pockets, business card slots, custom modified thumbholes, knockouts, etc. DVD replication (these are manufactured, glass master/pressed) includes 5C offset printed discs (or silkscreened if better suited to art) and a test disc so you can verify your playability on a pressed disc and disc artwork on the disc itself. Check below on our quote form, and if you don't see the DVD manufacturing package you're looking for, please ask, these are just the most frequently asked for packages!